Hyperbaric Central has the best of the best for your choice of Oxygen Concentrator — The Airsep NewLife Intensity 10 — providing you with the best flow and the best back pressure. FLOW: Although most popular concentrators are at 5 liters of flow, 5 liters, or the higher 8 liter, unfortunately won’t do. In order to bypass the 4psi pressure of your chamber, minimum flow of any oxygen concentrator must be 10 liters. BACK PRESSURE: Back pressure must be above the chamber pressure or it won’t have the power to bring concentrated air in. The higher the concentrator’s pressure, the easier it is for more pure oxygen to be concentrated and delivered to your body. You will love that while most concentrators rely on 10psi of back pressure, the Airsep oxygen concentrator, exclusively, offers you powerful 20psi pressure. Therefore, Airsep does not have to strain to push pure air into the chamber, and then into your body. 20psi also outputs less noise environment, because it doesn’t have to strain in the process of bypassing your chamber’s pressure. 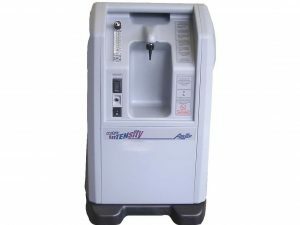 Airsep Oxygen Concentrators are the best at delivering more concentrated oxygen at the Best Price.